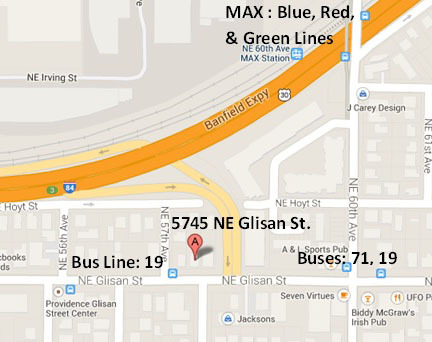 Tierra is located at 5745 NE Glisan St. 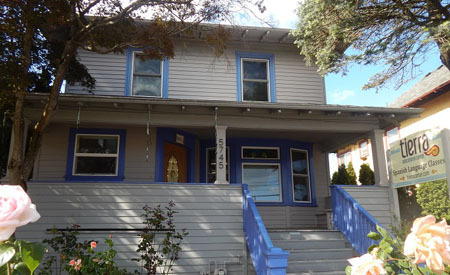 Located in the North Tabor neighborhood just off the I-84 freeway, this convenient location is easily reached from all corners of the city and is well-served by public transit, with stops for the 19 and 71 bus routes as well as the 60th Ave. MAX Station very closeby. You can find ample street parking on neighboring streets - please be mindful not to block our neighbors’ driveways. We encourage you to come by bike! Bikers can ride up the driveway to find abundant bike parking behind the building and come in through the back entrance. Please let us know if you have any comments, questions, or concerns about transportation or parking. If you are interested in visiting the center, please contact us to schedule an appointment. We would be happy to speak with you in person regarding our programs. We look forward to seeing you soon at Tierra!